I was wandering down the aisle of my favourite supermarket when I stumbled across individually packaged aubergines. That’s right, aubergines separately wrapped in plastic. I was suddenly furious – how did we get to this point when we are packaging singular vegetables in non-recyclable plastic? If I’m honest, being environmentally conscious never used to be a priority of mine because, after all, ignorance is bliss and convenience is pretty handy. But the older I’ve got the more I’m starting to understand consumerism, willful ignorance, environmental racism, and how we in the West are literally annihilating the planet all in the name of capitalism and convenience. Despite knowing all of this, I’m still far from perfect. When it comes to skincare, I must ashamedly admit I am an impulse buyer and a product junkie. Finding the right routine that works for my very dry and sensitive skin is a bit of nightmare. So, in my quest for the perfect skincare routine, I’ve ended up wasting lots of money and in turn not being as environmentally friendly as I’d like to be. A report by the Ellen MacArthur Foundation states that by 2050 there will be more plastic in the ocean than fish. That is terrifying. 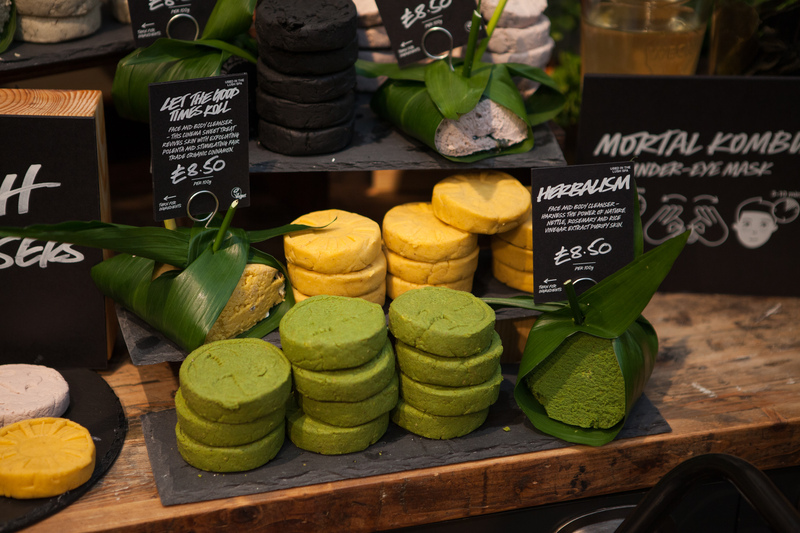 This, as well as Lush’s new packaging-free Naked shop, which recently opened in Manchester, inspired me to take on the challenge of going package free. So, how did I go about this? The first stop on my quest to a packaging-free skin routine was a consultation at Lush in Oxford Street. They are undoubtedly spearheading ethical cosmetics in the UK, making them the perfect place to start my journey. It was no surprise my consultation was fabulous; I sat down with a lovely member of the Lush team and we talked about my routine, then I was armoured with the products I needed to go package free: I got a seaweed under eye facemask called Mortal Kombu – I live for a Lush pun – solid oil face balms, the Movis facial soap made with real bread, and some face steamers. Going package-free takes a little bit of imagination and thoughtfulness. At first, I started my new skincare routine without planning what I’d do afterwards with my slightly damp soaps and oil bars. For the first week it resulted in me leaving them in the paper bags they came in or just on the side in the bathroom, which in hindsight isn’t the most hygienic option. My advice would be to figure out how you’re going to store your products before you start using them! Have a look around your house for what you already have. Old travel containers, soap dishes, jam jars or metal biscuit tins are all great options. Getting the products was the easy part but the application of the products needed a little more thought. I started off by ridding myself of cotton pads and face wipes. According to Water UK, “93% of blocked UK sewages pipes are caused by wet wipes”. And Be A Shade Greener estimates that the non-organic cotton industry uses “almost one-quarter of all the world’s insecticides and 10% of pesticides”. After seeing images of the gruesome fatberg, I for one do not want to contribute towards it. If you also want to prevent any more fatbergs occurring, avoid flushing sanitary products, wet-wipes or condoms down the toilet or cooking oils down the drain! Thankfully, my consultant at Lush gave me a very handy hack – old t-shirts! 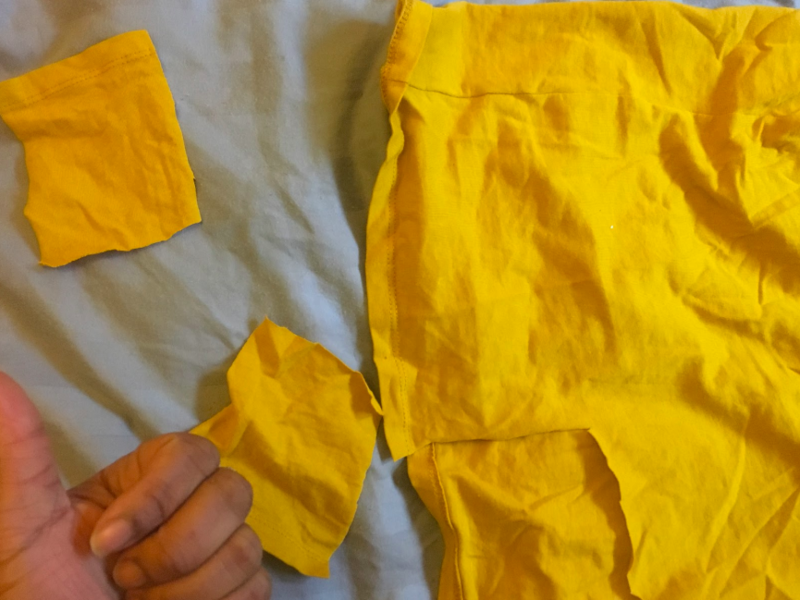 I took an old vest and cut it into squares. Because it’s already made from soft cotton, my homemade wipes were far less abrasive on my sensitive skin than a flannel. The best part is they can be reused, and you simply pop them in the wash with the rest of your laundry. 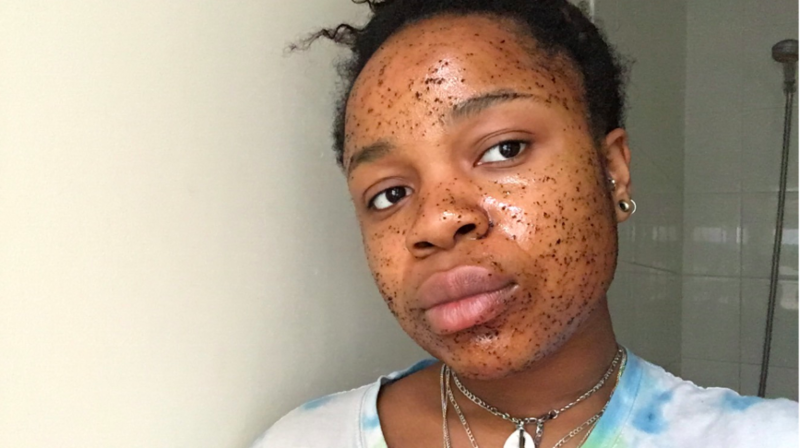 Although I received most of my products from Lush, this was also the ideal time to flex my creativity and come up with some of my own skin-care products. Using items I already had in my house, I concocted up a face and lip scrub in an attempt to fight the winter ashiness. I washed out an airtight jar (previously used for chutney) and then mixed together dark sugar, honey, coffee granules, olive oil and coconut oil. Not only does it smell like cake-mix and left my skin feeling so silky, but I didn’t need to buy anything extra, which in turn reduced my package waste. Being package free doesn’t have to stop at your skincare routine. There are heaps of ways you can entwine it into your daily living. Keeping a shopping bag on you is always a good idea and reduces your chance of picking up another one. If you can afford it, buying your fruit and veg from a market or local grocers saves on packaging. But if you can’t commit to a weekly trip to the farmers market, think about buying loose fruit and veg from the supermarket rather than the packaged variety. Trying to minimise the amount of one-use items in your purchase and swapping them out for reusable items is great too, like menstrual cups instead of tampons. Even simply buying items contained in glass or paper is much better than plastic. With the help of Lush, this challenge was reasonably easy and I’m no longer the product junky I used to be. Companies should be making it easier for us to purchase packaging-free items, but realistically we aren’t all going to live on a self-sustaining farm tomorrow either, so there are really simple changes we can all make to our day-to-day lives that will help look after our planet. We have a responsibility to make smart and ethical choices – why not give it a try today!